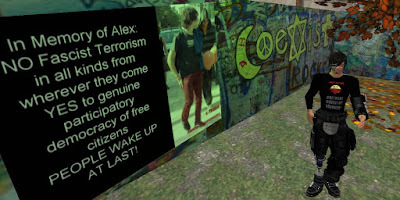 This is a long post – I apologise for this – but I wrote it in order to help me think through some aspects of my Second Life and my opinion on the future of Second Life Left Unity… It contains some never before published history of SLLU (for those of you interested!). I promise, for those who are not interested in politics, that this sort of political discourse will be rare. This article also gives some thought to what makes Second Life / virtual worlds, unique. And it is largely my opinion, though one borne on my SL experience and many discussions in SL in the past and also in the past few days. This article is by no means a conclusion… it is part of my ever evolving thought. As I mentioned,I have been talking to people in SL about the differences, pro and con, of SL compared with other media. Here I am going to outline some experiences that inform my view. Back in 1998/9, I joined a yahoo-group that promised “no rules” – a free place to talk. The group, apparently, had arisen from a dispute on an irish/American genealogy yahoo group. The group was called “Freepobal.” Freepobal was great. People posted ideas ; newspaper articles that had caught their eye; we debated and we discussed and some of us met up in “real life.” It helped me solidify my political stance – my politics had been caught up in the politics of Northern Ireland for so long, and with so much going on there during the nineties I had had no time for politics in Scotland. I had thought of myself as a socialist long – actually since I stolen a book on Marx 28 years ago ( - boy am I getting old… - I stole it to read it surreptitiously as being from a “unionist” background in Northern Ireland, reading Marx was akin to terrorism!). One of the “real life” meetings was at a rally in Arbroath Abbey on the anniversary of the Declaration of Arbroath in 2001. I had been invited along by an anarchist who in turn had been invited along by a member of a republican socialist group who were organising the rally. At the rally, a member of the Scottish Socialist Party, Rosie Kane, who was standing for election, made a speech. When I heard her, I knew I had found people like me! I joined shortly after. The conditions that had created my political mind explosion – the coming together of people and the synthesis of ideas etc, was, in my opinion because of a place that gave the room for people to express themselves easily – and without fear (I’ll come back to this in a minute). Some members of Freepobal may disagree on this – but then, context is everything – and I was someone with non-violent, Republican views being brought up in unionist/monarchic Northern Ireland! When I was on Freepobal, I made many mistakes – not least the mistake of treating those on the other side of their keyboard as some kind of “bot” – someone not human. I sometimes personalised the arguments, which in prose sometimes comes down to criticising someone because of something as petty as their punctuation. Sometimes I assumed people knew less than me on certain topics and would admonish people about things they said, only to find they came up with evidence to prove themselves right – or at least to give a more evidence based stance than my own! Freepobal kind of tripped along after that, but was eventually shut down by its “owner”. The experiment of a totally free group, in his opinion, had failed. Those who had been part of it tried setting up “Freepobal 2”, but the rancour, and negative emotions expressed meant that discussion rarely took place. For all of its final troubles, however, I doubt if anyone who had been there for a long period of time can say they did not learn something. Personally I learned a lot. Second Life Left Unity was set up in 2006 – a potted history of the group can be found HERE, HERE and by flicking through the archives HERE (www.slleftunity.com). These give a history of some of the positive actions SLLU took part in. People from across the grid were invited to help start a group were the anti-capitalist left could speak to each other and perhaps find common ground and collaborate on projects together. This group was based on mine and others RL experiences of Left Unity groups, such as, in my case the Scottish Socialist Party (in the case of one “Core” member – her bad experience of a sectarian left anti-capitalist group; in the case of another because of a want to see the English Left united; another because of her experiences on the left in California; another because of his experiences in Denmark…etc…etc). 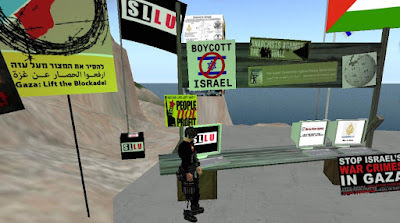 Shortly after we began the group, we came under attack by ideologues and, it transpired, also by a group set up by a man who was there to “spy” on the left (search for articles on Marshal Cahill and Second Life Liberation Army - SLLA). Cahill set SLLA up as a distraction for those who wanted to use SL as a tool for protest and agitation. His ruse was rather clever. 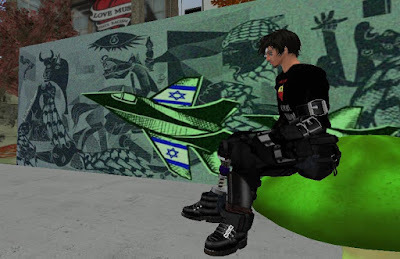 He used the premise of “no-Logo” and "avatar rights" to bring together people who were interested in attacking the “corporations”, and through the use of the Second Life media – and the fact that SL was new enough to get column inches in RL papers, made the cartoony “actions” seem relevant, when all they really did was draw attention to the corporations presence in SL. Statements by the corporations "attacked" gave them extra column inches in parts of newspapers they woult not have otherwise reached. 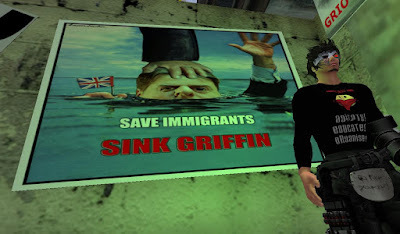 The SLLA actions did not stop people from going to Nike sims or any of the other sims he attacked – the nature of SL made that impossible - and in fact the "attacks", and publicity managed to do the opposite they were pretending to do. 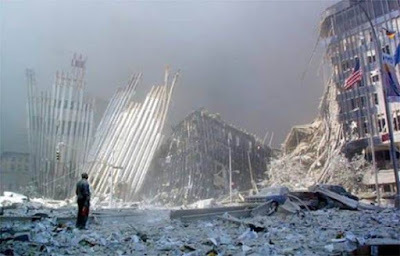 The corporation gained extra publicity and visitors and Cahill’s security company, which, it was proved, had connections with US security organisations, gained details of people who were at times RL agitators caught up in the “zeitgeist” and newness of the media. SLLU members had been suspicious of Cahill and his organisation from the first time SLLA members approached and spoke of “helicopter attacks” on their HQ etc, and most had stayed completely away from it – but some of the new organisation became caught up in it and then through it, attacked SLLU and its anti-toy gun and non/anti-griefing /non role playing stance (none of us had anything against role playing – but our remit was a real one – not one where we played at lefties!) The bad feeling this caused – and the subsequent suspicions raised by it, in my opinion could have been avoided if people had have thought about the projected outcome of their actions. SLLU, although still creating connections, places, events and exhibitions etc, closed down its decision making structures because of these attacks – the group controlling the organisation became smaller and perhaps in some ways, embittered. Even though the group had advocated “affinity groups” as the best way of organising in SL from early on, this rarely happened (though it did happen on occasion!). In my opinion, the experiences of real life, were informing second life too much. Although I go on to explain dynamics I feel Second Life possesses that are similar to real life, I also feel there are dynamics that are different, for example the “want” to play the game. The “want” and haste to be accepted by a group; the “want” and haste to make friends and the ability to do so by hiding behind a “front” (more about “fronts” later). These differences are as important, and synthesise with the similarities to create the whole second life experience. Before I go on criticising the organisation of the group, may I add, because SLLU was the first “Left Unity” group in SL – it was attacked a lot by the right – and the righteous – and through those attacks and perhaps BECAUSE of the closing down of the “core” – it survived and it still managed to create/ help/ highlight/educate etc. SLLU still managed to achieve a lot in, what I would call, it’s deformed democratic structure. I don’t want you reading this and thinking all was negative! I merely want to come to where SLLU is now. The fact is, though, as time went on, this “core” became smaller through internal conflict and RL commitments. SLLU had to open up, or wither and die. Last year, when the Greek Riots happened, a number of SLLU members came together and created an info hub. This info hub was used by people who were directly involved in Greece, and by people across the world who supported the actions in Athens. During this time, the SLLU core decided (after much discussion, debate, falling outs etc!) to open up. It was decided to trust people… even some of those who in the past had been more than critical… Slowly, notice giving rights were given out. Ownership of land was shared and meetings became adhoc affinity group organisation rather than the weekly meeting and dissemination of every nuance of what people said. During this time, a few people in the group argued over prominence of certain RL groups; but all in all, the actions around the Greek riots were self policed by those who worked hard on the installation and info-hub – and conflicts were resolved without much effect on the overall, positive outcome – ie a place to share experiences, express the conflict artistically, show solidarity and discuss events. After the Greek Riot actions, came the events in Gaza early this year. These created different problems for the group as there were opinions that divided, eg the one or two state solutions etc. Instead of using SLLU as a place to launch joint actions in support of the Palestinian people, people factionalised into micro-groups – some of them set up by individuals rather than groups – who then invited people to come to their “correct line” group. People at the centre of the SL left-unity project felt they had to allow the factions equal space – and then came under attack from both/all sides. The effect of this was to exhaust many who had built the group over a period of nearly two and a half years. People were no longer listening and collaborating; they were factionalising and shouting at each other. During this time, I left SL. I had been thinking of stepping down my involvement with SLLU for a number of months, but events in RL meant that I had to step away from SL completely. During my time away, some continued to collaborate – in particular the Feminist Network – who self-organised as an affinity group. The Feminist Network, according to all of the members I have spoken to, worked fantastically well. Those involved felt valued and felt they all gained something from the meetings and events organised. The Feminist Network continues, and in fact members of the group are very much core to the upcoming “16 days of Activism.” According to friends in the group, there were differences of opinion and styles – but these were overcome through discussion. People were able to “sit down” and work through differences – and agree to differ. This was a completely different approach to that of the previous two experiences (though to be honest, SLLU had helped organise other events in the past in this way – but with discussion between a smaller core and invited others-ie. less collaboration… more selectivity and therefore in a more “sectarian” way – even though those involved in the core were from different RL political backgrounds. The events and installations were narrower that they would have been with more people involved). Where does all of this take me? Well, having witnessed the growth and the success of the Four Bridges Project and “The Rings Discussion Group” and all of the other things associated with it; I feel SLLU, as a left unity group has an important role to play in bringing those together who use Second Life from an anti-capitalist, social-equality background. Personally, I do not see any reason as to why those on the anti-capitalist left cannot work hand in hand with the capitalist left on some projects. I think to think negatively in this way in SL and RL is to shoot ourselves in the foot and become a sect – shouting at the outside world from within our little “correct line” box. Marx said (paraphrasing) it was a good thing to think about the world we wanted and the best/ideal paths to that world, but we also had to act… and we have to act according to the conditions that surround us. If we have differences in real life – in our work or in our homes or in our play, if we resolve them, we do so because we have respect for each other as human beings. Second Life allows this, more so than yahoo groups or fora, because in it, we can work collaboratively to create and because of the fact we meet as avatars. These avatars may have fronts – we may portray ourselves as younger than we are; furrier than we are; more dynamic than we are etc etc, but politically the majority of these “fronts” do not matter (I won’t go as far as to say ALL fronts in SL don’t matter – but that is for other posts). We accept furries; cyborgs; dragons etc etc and still manage to have serious conversations and after initial “noobyness”, we can mostly get along without rancour. SL is more akin to real life meetings than fora. Before people meet for real, they can share experiences in SL, regardless if those experiences are building things, visiting places, discussion, gaming, love etc. Because of these things, SLLU and all groups that facilitate collaboration etc will work un-policed by committee or by a core etc. Unlike Freepobal, SLLU has not fallen apart in rancour – and most misunderstandings can be resolved – and quite a few have. SLLU, therefore in my opinion, can operate in two main ways. It can act as a hub for anti-capitalists. As a place to collaborate on anti-capitalist events or actions or installations. Secondly, and in my opinion in the present conditions, probably more importantly, SLLU can act as an interface between those of us who believe social equality can only be solved by a dismantling of capitalism, and those who believe in reform. There are many things we can agree on with reformists – nuclear disarmament, equality, anti-war, LBGT rights, feminism to name a few. And together we can inform each other and learn from each other. SLLU has been borne along on a bed of the teachings of Paulo Freire. What can be more freirien than collaboration, discussion and action? Virtual worlds have brought internet collaboration on a little more. My three years here have taught me that.